The inspiration was two fold. First, I wanted to tell my story to inspire others and encourage the reader to embrace life outdoors, adventure, and find their own path, whether it be on the crest of the highest mountains or in everyday life. Second, and more on a personal level, it allowed me to revisit and revisit this special time in my life. A time of rebirth, growth, and profound transformation. 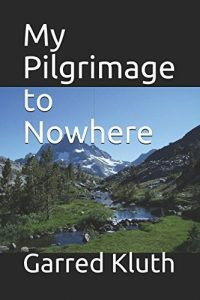 My Pilgrimage to Nowhere is a true story, and all of the characters and events actually happened. I did change their names for privacy reasons, and also to allow the book to flow in a narrative form. Setting out on a trek such as this was more of an inward journey than an outward test of physical endurance. With aching muscles, it became my goal to move by will alone as I danced along through the natural wonders of this world and celebrated the chance to truly be alive. Sitting around the campfire that night just outside of Warner Springs with Crash and Nightingale, the vast scope of the adventure revealed itself. We conversed about the many levels of the hike, from the physical to the mental to the emotional to the spiritual. Layer upon layer of trials and growth. We called ourselves pilgrims, but realized that there really was no destination, no holy monastery, no mecca, no temple at the end waiting for us. The journey itself was our destination and our sanctuary. This was our pilgrimage to nowhere.